This is one more example of an idea that didn't make it into a official publication. 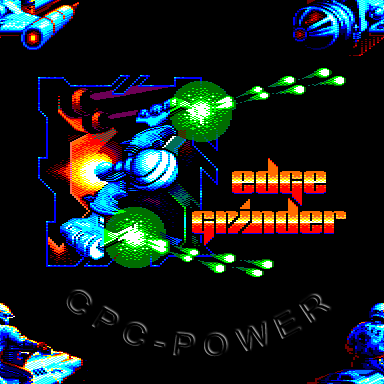 This short intro was intended to become the introduction screen for the GOS Party - The Revenge Megademo in 1992, but Thriller turned this intro down, because he said that he didn't have any space left on the disk for this demo and since the demo used system calls to define the colors it wasn't suitable for the GOS Party - The Revenge demo. I just thought that the idea was funny. As you can see I changed the original "Enter at your own risk" text into "Enter on your own task" to convert this sentence into the computer world (even though the CPC didn't have anything like Multitasking). Since it wasn't used for the GOS Party - The Revenge Demo I added it as yet another cheat part to one of my Divine Megademo parts. Actually it's a cheat part within a cheat part. 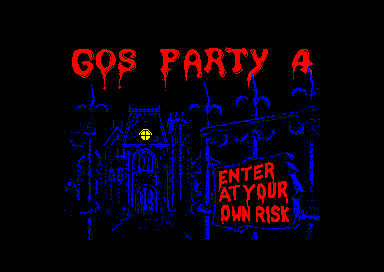 That is, you have to go to the Orgasmic Park picture first and then you can access this GOS Party 4 Intro screen. Start the Wishing Well Construction Kit. Go to the instructions screen by skipping the intro with the space bar. On the instructions screen hold the keys "o", "r", "g", "a", "s", "m", "i", "c" simultaneously to get to the Orgasmic Park picture. When the blabla is over and you can see the picture and hear the music, you have to type (character by character) the word "task" (don't hold these keys down simultanouesly!). Then you should get to the GOS Party 4 intro screen. 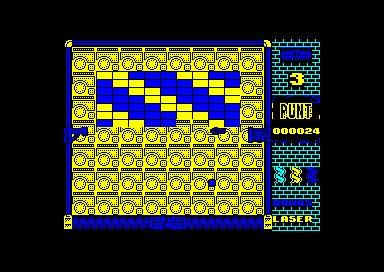 Sometimes the CPC doesn't get the command to fix the screen right and the picture looks badly scrambled. Then you have to restart from the beginning. Cheat part de la "Orgasmic Park"